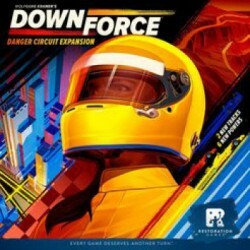 Downforce: Danger Circuit, an expansion for Downforce, consists of two new tracks on a double-sided game board as well as six new racer powers to shuffle with those in the base game. High-stakes bidding on million-dollar race cars. Frantic bets placed in secret even as the cars race around the track. And to the victor, the biggest purse of all. 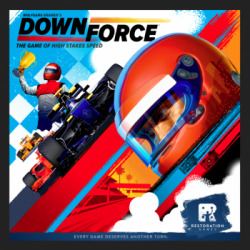 But, in the world of motor racing, the margin between victory and defeat can be a single moment: a steep banked turn, tires screaming and spitting out smoke, and the downforce, pressing you down in your seat and keeping you on the track as you make your move inside to pull ahead.